There's nothing like a fresh cup of hot cocoa for a sweet treat or to break the grip of a cold winter morning. However, while many traditional hot chocolate recipes call for steamed or warmed milk, Keurig beverages must be made with water. Once you've added filtered water to your Keurig, you can choose from a wide variety of delicious chocolate options to fix a cup of this delicious treat. 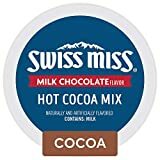 The Swiss Miss Milk Chocolate Hot Cocoa Keurig Single-Serve K-Cup Pods are the hot chocolate you remember, so get out the marshmallows you enjoy. This is a real dairy product. You'll want to shake each pod before using it and take care when extracting the pod; this beverage may settle. If you get watery hot cocoa from the first pod, make sure to shake the others before using. Take care to wipe up any residue; this hot chocolate is quite sweet and may be sticky. Swiss Miss Hot Cocoa also comes in a light variety (Swiss Miss Sensible), so you can enjoy all the goodness without all of the calories. Fans of dark chocolate will love the Café Escapes Hot Cocoa K-Cup option. This is a true dark chocolate and may not be popular with children, so save it for the grown-ups! This chocolate is trans-fat and gluten free. This beverage does have a distinctive smoky edge to it. If you hate coffee, you may not like this drink. Please note that these K-Cup packs feature marketing on the outside that encourage users to try the many varieties available from Café Escapes, but don't be misled. You purchased one flavor of decadent dark chocolate, not a variety pack. Now this is a variety pack! The Brooklyn Bean Roastery Hot Cocoa Variety Pack Single Cup for Keurig K Cup Brewers is loaded with plenty of options. From peanut butter cup hot cocoa to Mexican chocolate, you can enjoy a variety of flavor combinations in this package. The Mexican hot cocoa has some real zing, so if you're not a fan of heat, try the lush milk chocolate. While many of these products contain soy and milk, these are not your standard milk chocolate flavors. Again, this is a "late at night, grown up chocolate" sort of beverage. Is it too cold to get out for donuts and hot cocoa? Make some pancakes instead and open a box of Dunkin Donuts Milk Chocolate Hot Cocoa K-cups. You can enjoy a fresh cup of hot cocoa without having to shovel any snow. If you've struggled with watery hot cocoa in the past, this is the product for you. 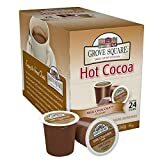 The Grove Square Hot Cocoa in Milk Chocolate is a terrific option for little palates or for anyone who needs something hot and sweet to warm them up. This product is Kosher Certified and the product line also offers cappuccino and a dark chocolate option. It's critically important to never add any liquid other than water to your Keurig reservoir. Keurig machines reserve a cup of water in an inner reservoir, which is how they can heat and dispense hot beverages so quickly. Burned milk on the heating element of your Keurig. A combination of spoiled milk and water in the internal reservoir. You may add water to dilute this trapped milk, but you probably won't be able to get it all out and need to follow more detailed instructions on how to drain a Keurig. Milk is fragile and can't stay fresh at room temperature, so you'll wind up with spoiled milk hanging around in the bottom of the pot. Fans of homemade hot chocolate mix can still enjoy it; just use the Keurig to heat the water and pour it over the powder, stirring as the machine fills your cup. If you're feeling adventurous, there are plenty of Keurig hot chocolate options for a wide variety of tastes. Of course, the best Keurig hot chocolate is the one that suits your taste, that dissolves fully and that is easy to clean up. Hot chocolate K cups are generally loaded with sugar and may result in a sticky residue on the puncturing mechanism. Hot chocolate is a great seasonal treat and a wonderful holiday addition. Go with gentle flavors for the kids and get something a bit heartier for yourself. Keep your Keurig clean by running plenty of water and coffee through it after making anything sweet. If you notice clogs, try the pre-puncture step with the lower needle.